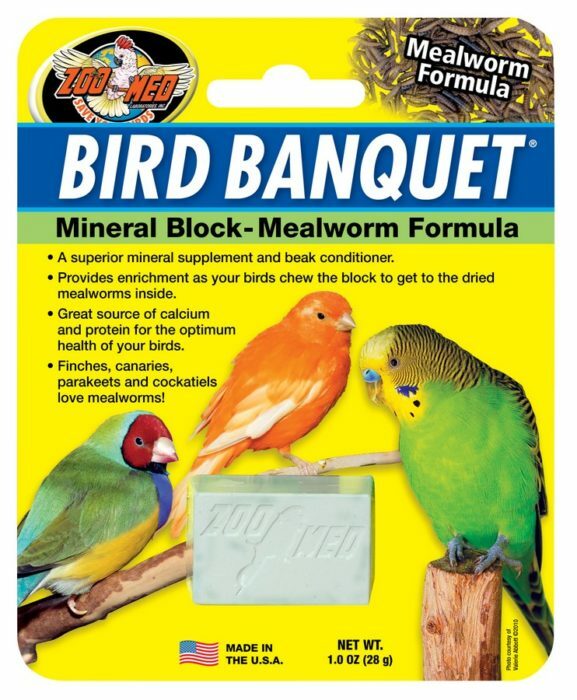 Bird Banquet® – Mealworm Formula | Zoo Med Laboratories, Inc. Zoo Med’s Mealworm Formula Bird Banquet® is a mineral supplement and beak conditioner that is a great source of calcium and protein, while providing enrichment for your feathered friend. Provides enrichment as your birds chew the block to get to the dried Mealworms inside. Great source of calcium and protein for the optimum health of your birds. 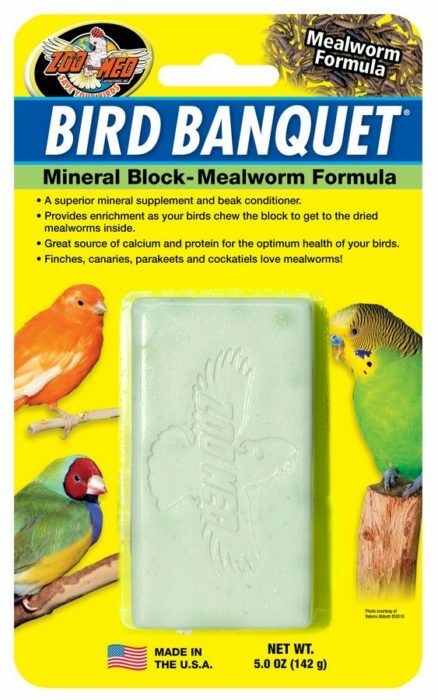 Finches, Canaries, Parakeets, and Cockatiels love mealworms! Calcium Sulfate, Dried Mealworms (Tenebrio militor), White Millet, Canary Grass Seed, Oat Groats, Suncured Chopped Alfalfa, Ground Oyster Shell, Silicon Dioxide, Ground Limestone, Dicalcium Phosphate, Niacin, L-Ascorbyl-2-Polyphosphate (source of vitamin C), Thiamine Hydrochloride, d-Calcium Pantothenate, Pyridoxine Hydrochloride, Biotin, Beta-carotene, Iron Oxide, Manganese Phosphate, Manganous Oxide, Copper Carbonate, Diiodosalicylic Acid, Zinc Carbonate, Propylene Glycol, Cobalt Carbonate.